And now that we know how much better the new color looks than the yellow, I cannot wait to keep going. My goal, one room a month. Greg is thinking one room every other month. Maybe we can compromise on one every six weeks? We already have the dining room/kitchen color picked out. That will be next. Still working on what to do in the bedroom. Haven’t even started to think about the office, the extra bedroom or the basement yet. But my house is certainly filling up with paint swatches. We still have a lot of work to do to get the room put back together. But what a difference already. It’s finally starting to feel like home. What to do with a giant window? Ever since we moved into this house five months ago, I have been struggling with what to do with our amazing (and amazingly large) living room window. It’s a beautiful feature, that until last weekend, we had covered with temporary paper blinds for privacy. Last weekend, we took them down to add some shrink wrap to help with the drafts. Now we live in a fish bowl, and I refuse to put up more paper. Why is this window such a challenge, you ask? Above, you can see what it looks like now. It’s over 10 feet wide. And it’s divided into 6 equal sections, as opposed to a more typical set up with 3 double hung windows in a row, it’s not as easy to hang three sets of blinds or shades here, because the mullions that divide each section vertically AND horizontally are on the same plane. This means that any type of tradition blinds have to be mounted to pass in front of the trim, instead of fitting between the two verticals. Do you follow? Therefore, our front runner solution at the moment, is the first picture, with the series of vertical panels that fit into a triple track. They can slide next to or in front of each other to create different layered effects. 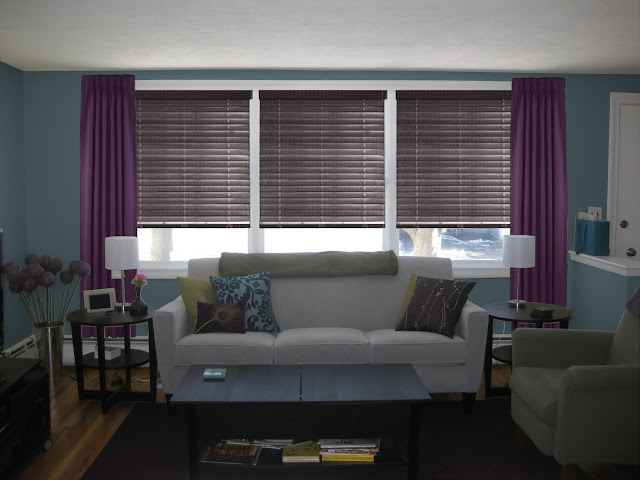 Other considerations are natural woven shades with a top-down option. Unless we went with one extremely long shade (so long, the dimension requires a special phone call to customer service) I think we need the accent drape at each division. It’s actually a beautiful look...one I like a lot. But, it’s more traditional solution, and disguises the fact that the window is so unique to begin with. I could just as easily be those three double hung windows I mentioned before. I’ve looked at different types of natural materials as well. And, I’m experimenting with the paint and drape colors of course. Lastly, I looked at traditional blinds. See what I mean about covering the gaps between them with a drape? So, I continue to ponder, although I’m leaning toward the first image. I would love to hear what you all have to say! I like the first one, too. Would you lose too much light, though? I love light. Are there any sheers these days that don't look too dated? That with the panels in the middle would give you privacy and light. But, looks-wise, I love the first. And now I want you to come to my house and redesign everything! I like the first and last looks. The gaps in the last look add an interesting element. I don't think you should cover them. 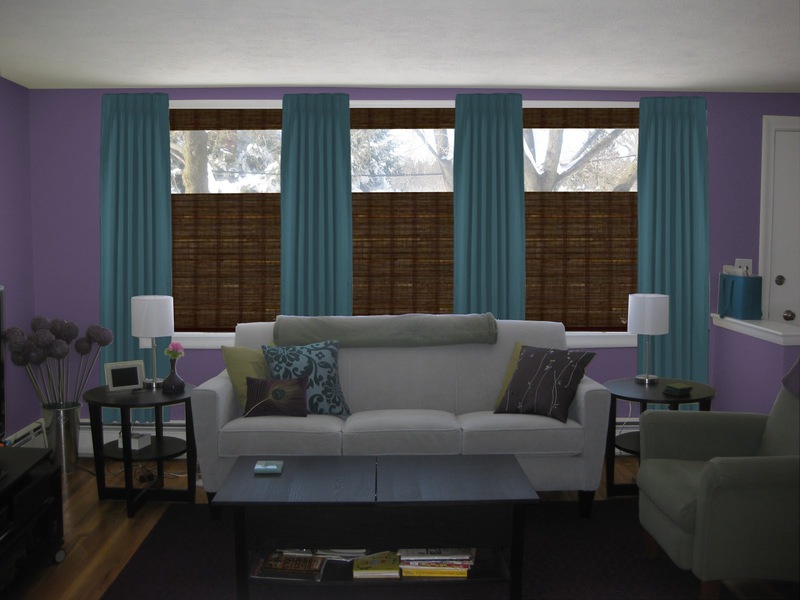 Could you differentiate the horizontal vs. vertical mullions with color? and/or emphasize/de-emphasize them? Looking at the last picture if you painted the horizontal mullions the same color as the wide wood blinds they'd not exactly disappear but be less noticeable with the blinds open. I'm not really understanding what you're saying in the first picture but I'd be concerned if you can't totally open the blinds you'll lose a lot of light when you want it. I think the reason I like the first option is that although the panels are sheer, the are flat vertical panels, as opposed to sheer drapes, which, Alicia, I agree, feel dated these days. The flatness feels more modern to me. The idea with this system is to always let the light in, and control the level of privacy by either opening or closing the panels. 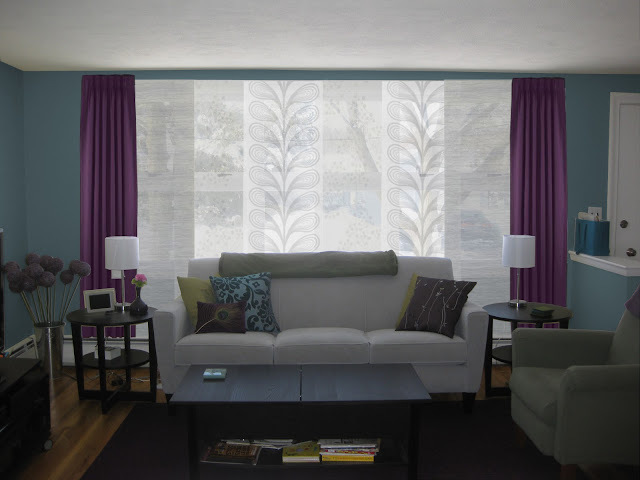 When they are totally open, the would still overlap the sides of the window by a few inches, but hopefully the fact that they are transluscent would minimize any potential light loss. 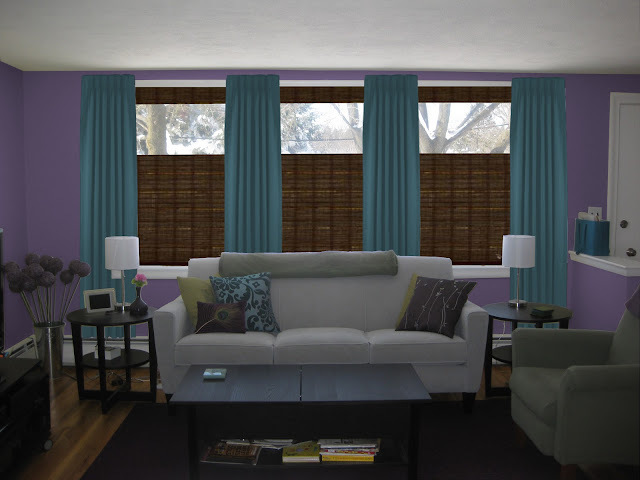 Not to mention, we could probably to this with about $200 vs the more traditional shades for around $1000! All fantastic looks, but I think the vertical panels are really you. I do like top down option, too, but perhaps in a few years, you will need a change (knowing you) and could reserve that option. Those sheer panels are really pretty. Are they complicated to install or to open and close? Will & Robin brought over a beautiful bouquet of flowers on New Year’s Day. It seems that in any bouquet of mixed flowers, some will last longer than others. 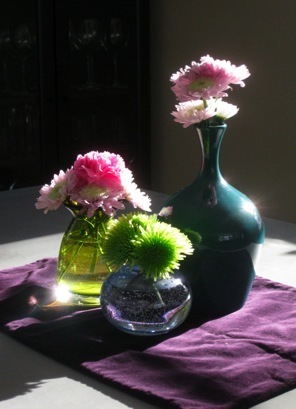 Today I reconfigured the flowers that were still on good shape into a collection of vases. I’m really happy with this assortment of colors. It’s good inspiration for where I was to take our decor. We JUST got it on Friday afternoon, with many thanks to Gina, who was able to order and pay for it for us before it was even en-route to the Lowes where she works, and some Christmas cash from family. Today’s snowstorm is of colossal proportions. And all I had to shovel was the front steps. And my superhero put it to good use. It's a beautiful machine, deserving of living in your garage. As I have mentioned previously, we have my mom’s old couches in our basement. At one point, she wanted a change, and gave these slip covers a try. She never had much luck with them, and I can see why. Just take a look at that love seat. Yesterday, we bought a few pvc pipes to shove down between the cushions and the back of the couch. It’s an old trick which makes it harder for the cover to come un-tucked. I’m hoping it works for us here. Greg needs to cut the second pipe to size so I can take on the love seat next. Other than the fussy slipcovers, the basement is coming along, slowly but surely. This shots give you a good idea of how much light we actually get down there. But I can’t wait to paint a lighter color. I think it will make a big difference. A few days before Thanksgiving, I put together this bathroom storage cabinet. And yes, I’m just getting around to talking about it. That’s what the holidays will do to you. This regrettably pink bathroom is slowly coming together. I’m trying to play up the black and white to give it a graphic quality. You can see, without the cabinet, we were desperately in need of storage. 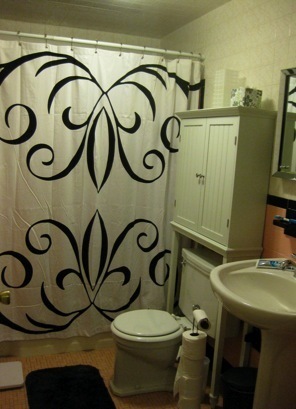 Pedestal sinks may look nice, and make a room feel bigger, but where the heck are you supposed to put all your stuff? And this sink doesn’t have a flat surface anywhere, so you can’t even set down a bottle of soap without it possibly sliding off. I’m still looking for a small cabinet to fir to the right of the sink to add more storage, and the desired flat surface. It’s also taken me longer to fill up this cabinet then it has for me to write about it. We still have bins full of random bathroom stuff that need to be properly stored. I think that might be tomorrow night’s task. It looks so elegant...nice job! 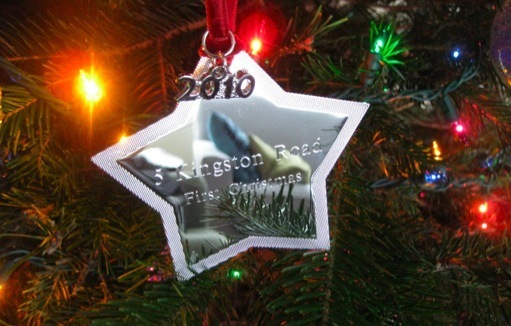 Today is our last official day of Christmas, and what a wonderful first Christmas it has been at Kingston Road. We kicked it off a few weeks ago with our housewarming party. The real Christmas marathon began on Christmas Eve, with the delivery of Grampa Louis’s brand new exercise bike, followed by chinese food with friends. Christmas morning was spent at home where we made a big breakfast, and opened our gifts to each other, including this lovely ornament Greg got me. We then headed off to George and Nancy’s for dinner. Boxing Day brought us to NY, just in front of the blizzard, for more festivities with my Mom, Will, Robin & Clara. We were back in Boston in time for New Year’s Eve with Robin’s family in Medford, and a quick night cap before midnight with our friends. New Year’s Day was spent at the traditional brunch, this time hosted by Jeff and Andrea. And then, one more afternoon with Clara at our house, where she got to meet her cousins, Chrissy, Paul, Henry & Liam. And after all of the fun and chaos, we have finally arrived at Second Christmas, the traditional French Family celebration. We’ll be heading to Ginny & Elmer’s this afternoon for one last day of Christmas. After today, we’ll finish taking down the decor, and get back to business with getting this place into shape. Stay tuned for more projects to come! Happy New Year! What wonderful memories!!! Another year in the memory books! And what a great year it was for your family!!! Happy 2011 Jen and Greg. thanks for sharing your projects with us. We are looking forward to enjoying the next round. love you. Sorry to leave my above comment as "anonymous". Next time I will be more careful. Happy new Year! !